A classic among burning programs brand new! Get the best program for your disc recorder! 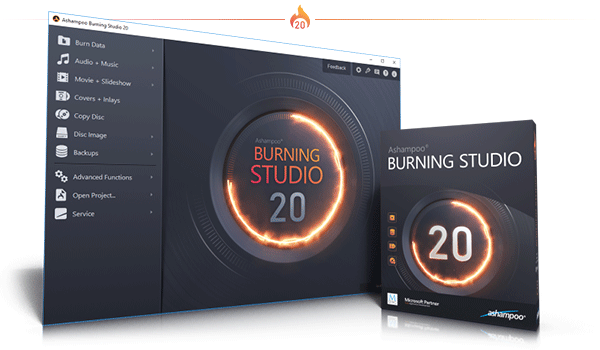 The new Ashampoo Burning Studio 20 is the easy and comfortable solution to burn your data to CD, DVD and Blu-ray, copy discs or use extensive multimedia capabilities to create your own slide shows and video discs with animated menus. Rip audio CDs fully automatically, back up your files in a flash and design and print individual covers for your projects in the process! Safeguard your files with scratch protection against data loss and use encryption and password protection to maximum security. Experience the best Burning Studio ever! The popular backup feature has just gotten more powerful. Backup plans help you back up your data and even remind you when it's time for a backup! The new improved backup manager provides a quick view of your existing backups and supports instant updates. It couldn't be any easier! Worried your data won't fit on a disc? No problem, thanks to disc spanning, Burning Studio can fit your data across multiple discs automatically including password-protection! Creating covers and inlays has always been a strong point of Burning Studio. In version 20, we've completely redesigned and reworked this module! The new intuitive start menu sets you off in the right direction and has you select your favorite images right away. After that, it's step-by-step to the finished cover. The import feature helps you analyze your disc and will automatically download the required metadata from the internet and create a suitable track list for you, if needed. Whether you need to quickly whip out a cover or design your own from the ground up, you won't be disappointed! Yes, disc burning can be that simple! Many first-time users are stunned when they use Burning Studio for the first time. It's that easy? Yes, it's all centered around three steps. Select your files, select the processing method and select the target. Need an animated menu for your video DVD? It takes just a few clicks. Want to backup your photo collection across multiple discs? With Ashampoo Burning Studio 20, anyone can do it! When you're burning discs for your car radio picking the right format is crucial or you'll lose the song order or end up with a non-playable disc. The new Burning Studio 20 has got you covered! With over 1600 presets and profiles for all common car radios, almost twice as many as version 19 , your discs will work the way you expect them to on any device. The program now also supports multi-disc CD player emulators and both equalizer functionality and normalization. Song or audiobook, Burning Studio 20 offers the best listening experience on the go! With Burning Studio 20, there's no limit to what you can do! Cut your movies, add intros and outros or insert subtitles or ready-made themes for professional results. Wow your friends and family with stunning slideshows with background music and turn your precious memories into a visual masterpiece. 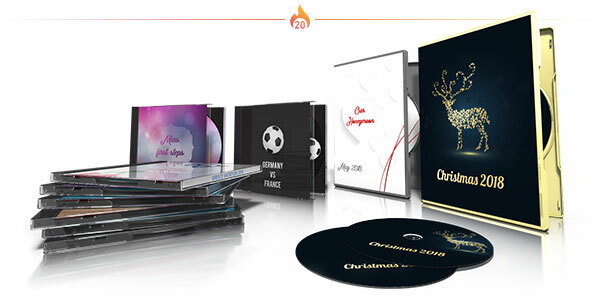 Design individual covers for your audio CDs and use the fascinating mosaic feature or the many templates. Family celebration, job event or vacation, with Ashampoo Burning Studio 20, brilliant results are guaranteed! The new Ashampoo Burning Studio 20 respects your work flow. Instead of loads of nested menus that require dozens of clicks, Burning Studio provides instantly accessible solutions. Need great results fast with little need for customization? 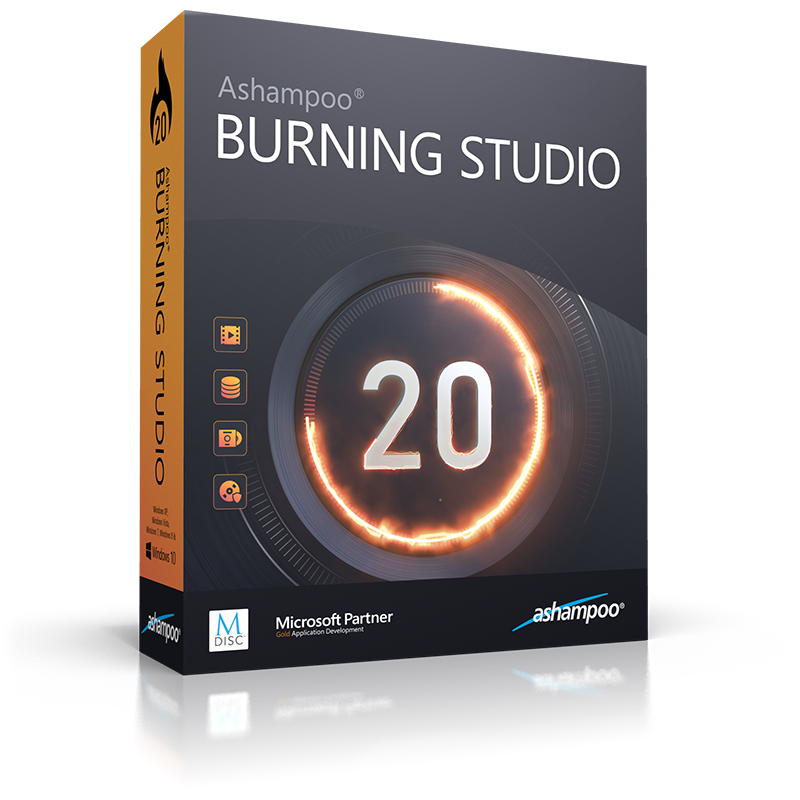 Ashampoo Burning Studio 20 is the program for you. Clever auto-features and carefully selected presets take the work off your shoulder and meticulously designed visuals avoid unnecessary eye strain. With both a dark and high-contrast light theme, maximum readability is guaranteed for everyone! The clever disc ripping feature in Ashampoo Burning Studio 20 extracts audio from disc in a matter of minutes! Artist and genre are automatically recognized, there's no need for manual input. Turn audio CDs into high-quality audio files with meaningful file names and select from a variety of different formats! Naturally, you can then turn your files into music discs, along with equalizer and volume adjustments for an even better sound experience, and add your own cover designs. Sounds good? It is! The proven scratch protection technology ensures your data stays safe. Scratches can render disc surfaces unreadable and files irrecoverable. 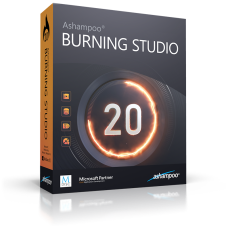 Ashampoo Burning Studio 20 take the terror out of scratches by spreading multiple copies of your data across the disc along with an emergency recovery tool! This way, you can still recover your precious files and memories should a disc ever become scratched. When time is of the essence, it takes just a few clicks to combine images and videos with suitable music to create movies. No need for long-winded menu navigation and no additional manual work required. If needed, you can manually adjust image transitions and display durations for that extra bit of individuality - otherwise it's one more click and you're done! Burning Studio 20 offers versatility even with simple tasks like burning data to CD, DVD or Blu-ray. Disc spanning spreads data across multiple discs automatically, auto-play discs support individual designs and menus while encrypted discs come with password protection for maximum security. Copying discs is hassle-free and supports on-the-fly modifications. The new scratch protection ensures your valuable data stays readable even with damaged disc surfaces and the streamlined disc burning dialog gives you great results faster! Creating and burning movies is one of Ashampoo Burning Studio 20's strong suits. To make movies compatible with retail players, they have to be converted into a suitable format. Burning Studio has got you covered with MPEG4, H.264 and AAC along with sound formats like MP3, WMA, OGG and more. Burn everything from simple cellphone recordings to ambitious amateur movies in style with Burning Studio 20!